(It should be noted that on the same day, 1 July 1955, the old VF-102 was redesignated VA -36. 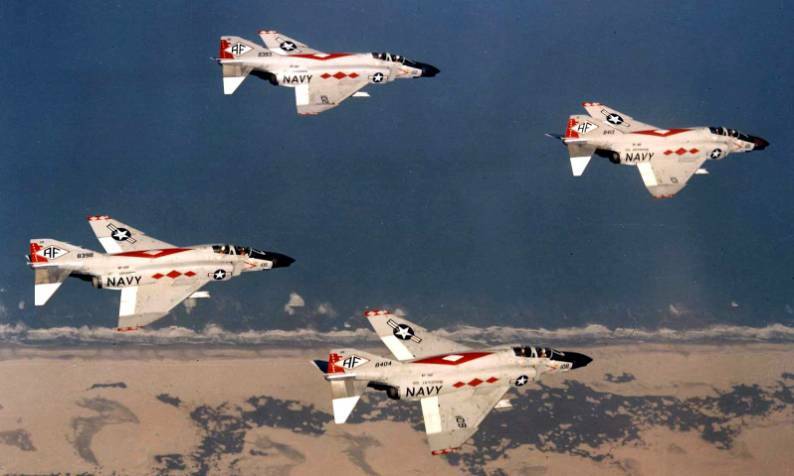 Fighter Squadron 102 (VF-102), the DIAMONDBACKS were established on July 1, 1955 in Jacksonville, Florida. 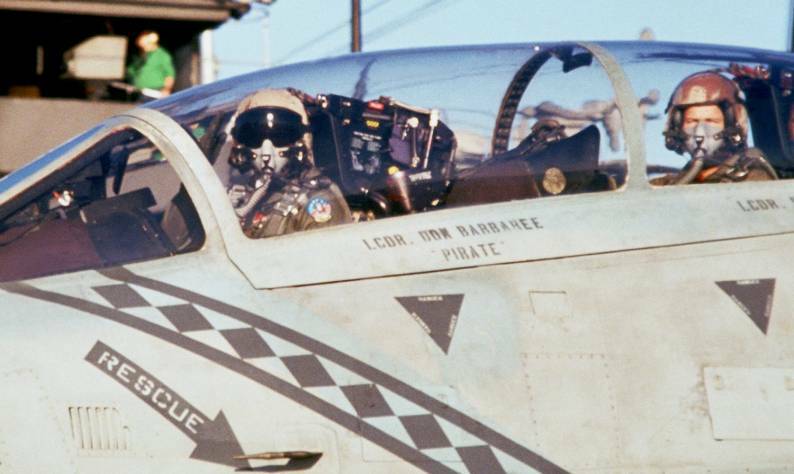 The first aircraft to carry the distinctive DIAMONDBACK markings was the McDonnell F2H Banshee, a twin-engine fighter-bomber with four 20 mm internal cannons. 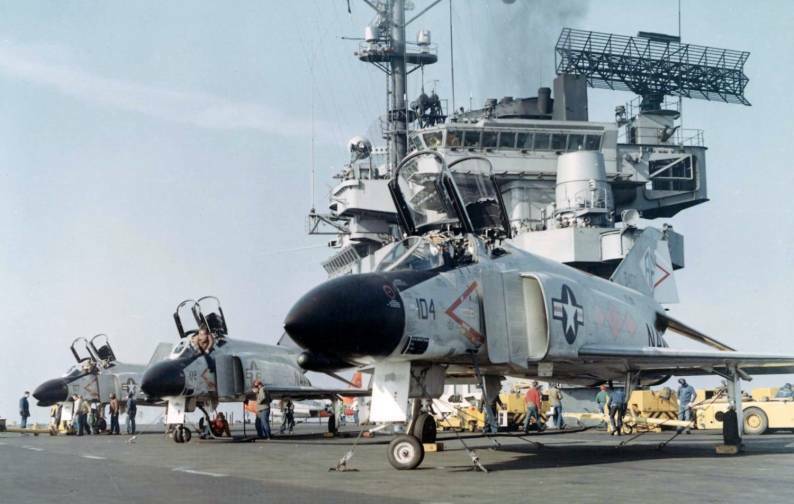 After a final deployment with the Skyray onboard the USS FORRESTAL (CV 59) in 1960, the DIAMONDBACKS moved to NAS Oceana, Virginia and transitioned to the F-4B Phantom. The Mach 2 capable, two seat aircraft consisted of a pilot and a Radar Intercept Officer (RIO) and carried only air-to-air missiles. This marked the beginning of a 20 year association with the Phantom. 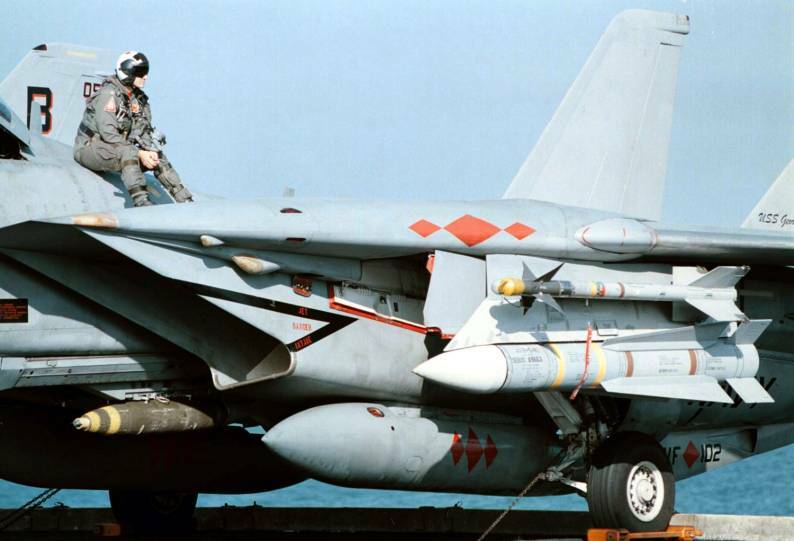 Highlights of this period include participation in Operation SEA ORBIT, the first Nuclear Task Force circumnavigation onboard USS ENTERPRISE (CVN 65), winner of the Battle Efficiency (“E”) Award in 1964 and 1966, combat operations off the coast of Vietnam in 1968, a Meritorious Unit Citation in 1970 for the Jordanian Crisis Deployment and cross deck operations onboard the H.M.S. ROYAL in 1975 and 1978. 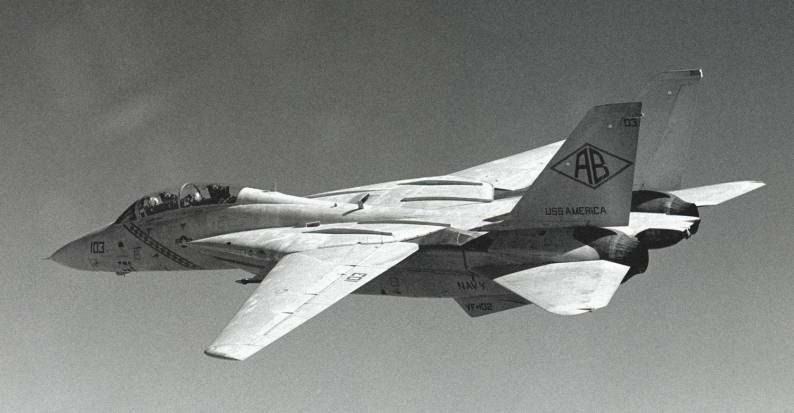 The DIAMONDBACKS bade farewell to the Phantom in June of 1981 and transitioned to the Grumman F-14A Tomcat. 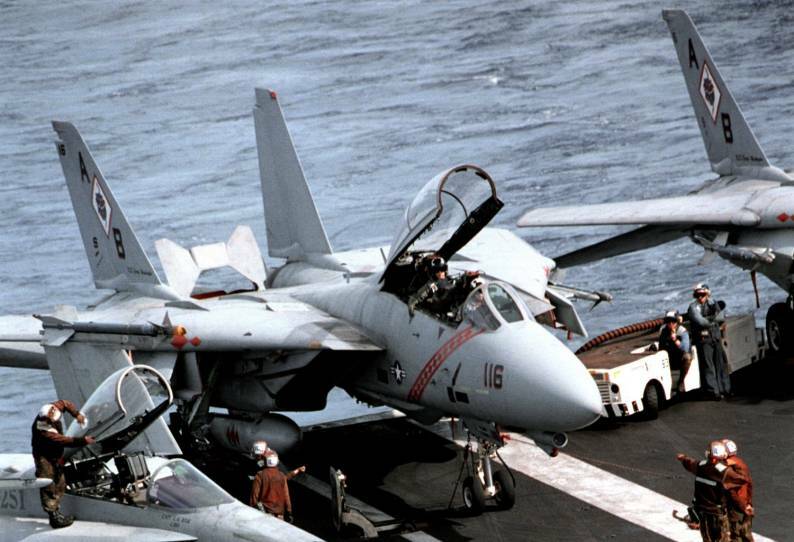 The Tomcat’s design provided the pilot and RIO with a formidable air-to-air radar and weapons system. 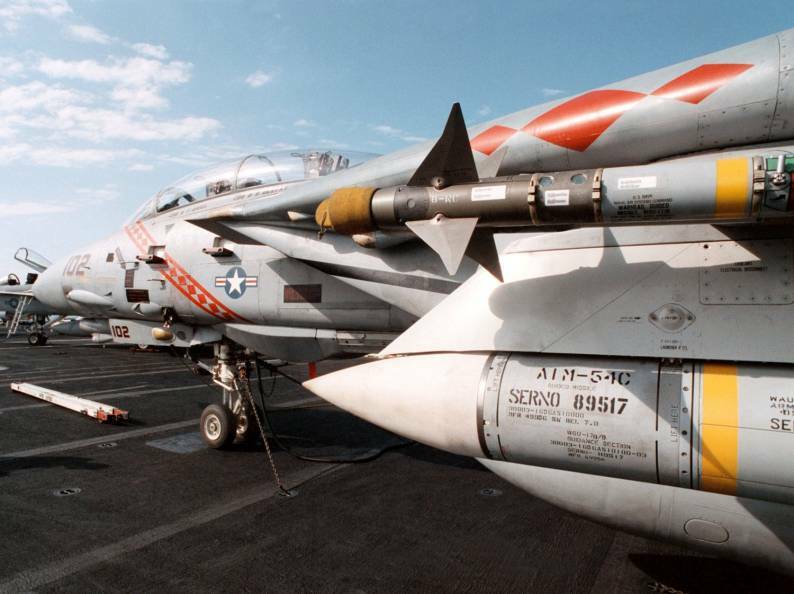 The long range AWG-9 radar and its multiple track, multiple launch capable AIM-54 Phoenix missile system, AIM-7 Sparrow missiles, AIM-9 Sidewinder missiles and the six-barreled 20 mm cannon comprised the Tomcat’s weapons suite. 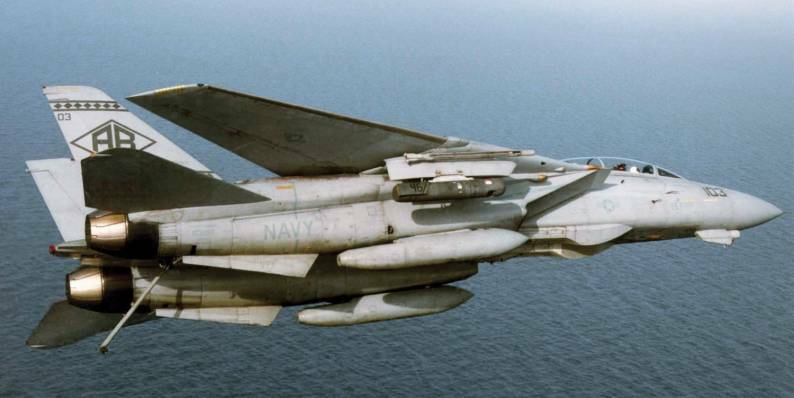 With the addition of the Low Altitude Navigation Targeting Infrared for Night (LANTIRN) pod and the Tactical Air Reconnaissance Pod System (TARPS) to the Tomcat, the DIAMONDBACKS added the strike and tactical aerial photo reconnaissance missions to their traditional fighter role. In March of 1986, the DIAMONDBACKS departed Oceana onboard the USS AMERICA (CV 66) and headed directly for the Gulf of Sidra. 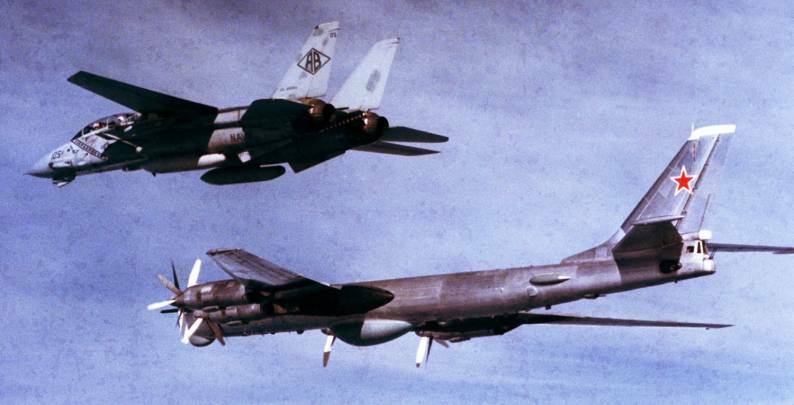 The DIAMONDBACKS will long remember the operations below the so called "Line of Death," especially our part in the history making raid on the 15th of April, 1986. 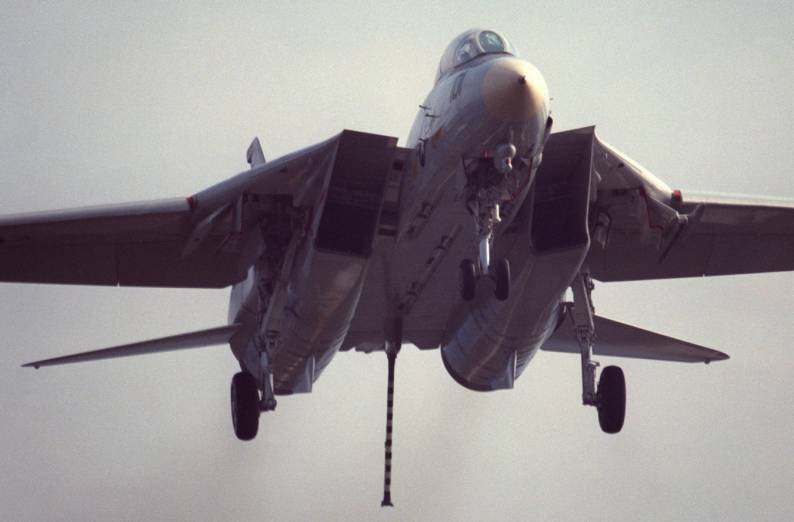 In the fall of 1990, VF-102 completed an accelerated work-up phase and deployed in late December to the Red Sea as part of Operation DESERT SHIELD. Two days after entering the Red Sea, the DIAMONDBACKS began flying strikes into Baghdad and other strategic targets in Iraq. 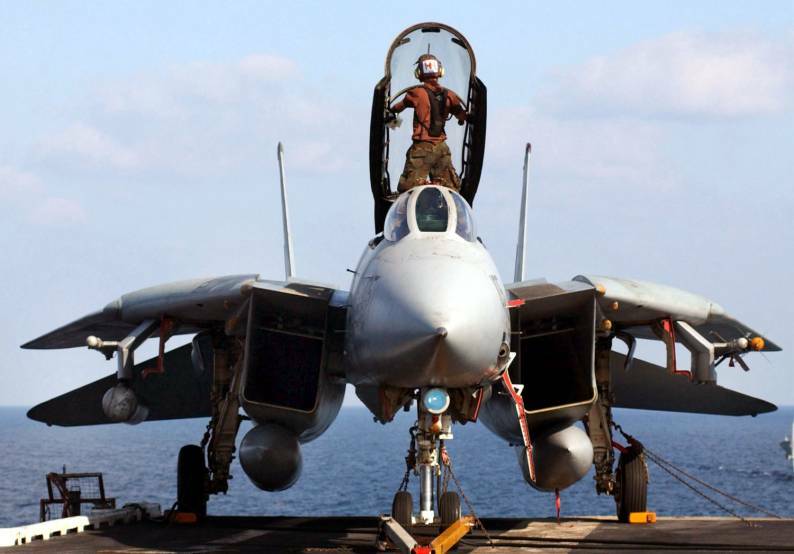 VF-102 logged more than 1,400 combat hours during the six-week campaign, flying a variety of missions from both the Red Sea and Persian Gulf. 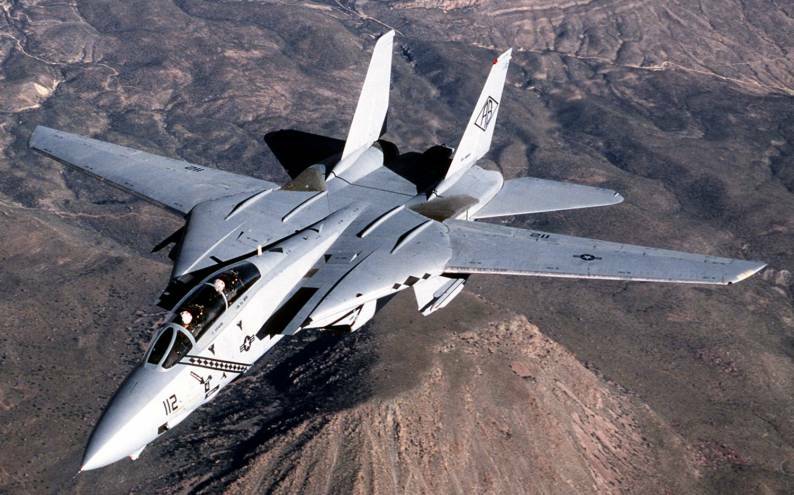 In 1992, VF-102 and the F-14 Tomcat entered the critical air-to-ground mission area thus solidifying the DIAMONDBACKS’ role as a strike fighter squadron and leading the way into the 21st century. 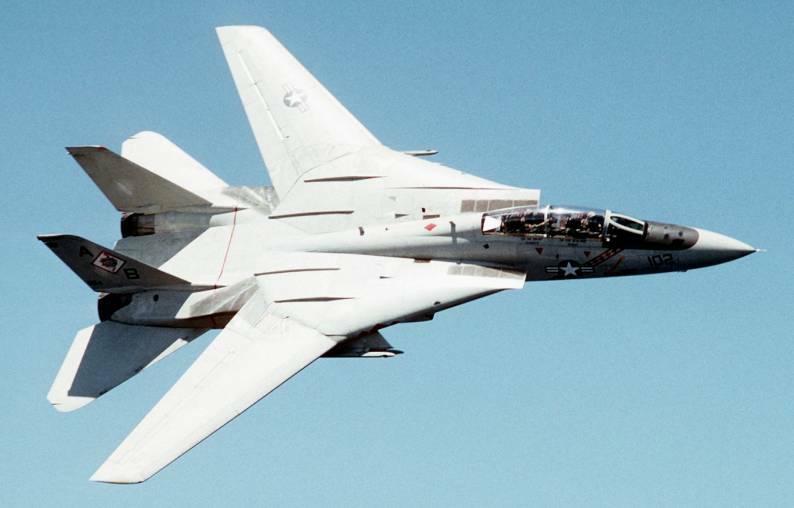 The DIAMONDBACKS transitioned to the F-14B Tomcat in 1994 and were the winner of another Battle “E” in 1995. 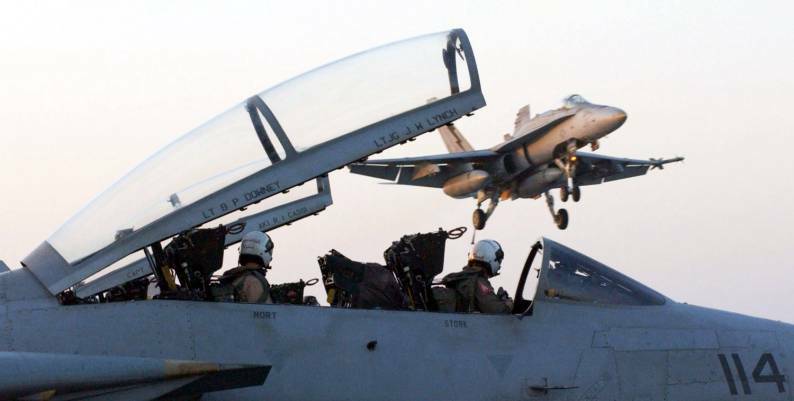 In the wake of the September 11th terrorist attacks in 2001, the DIAMONDBACKS departed NAS Oceana onboard the USS THEODORE ROOSEVELT (CVN 71). VF-102 arrived on station in the Arabian Sea in mid-October and flew combat missions in support of Operation ENDURING FREEDOM. 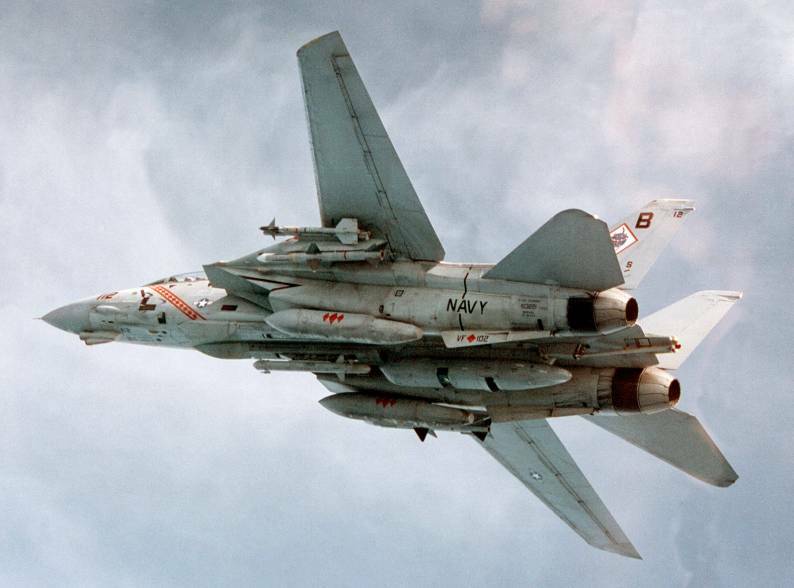 During that deployment, VF-102 flew 3,346 combat hours and dropped 645 bombs against enemy Taliban forces. 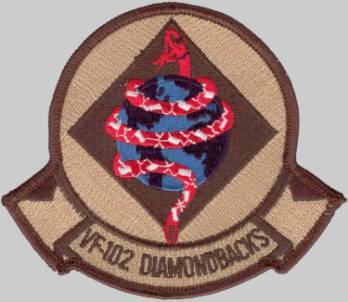 The DIAMONDBACKS were awarded a Navy Unit Commendation and the Battle “E” Award for 2001. Following their return from deployment and Operation ENDURING FREEDOM, VF-102 was assigned to Commander, Strike Fighter Wing Pacific and transferred to NAS Lemoore, California to transition to the Navy's newest strike fighter, the FA-18F Super Hornet. 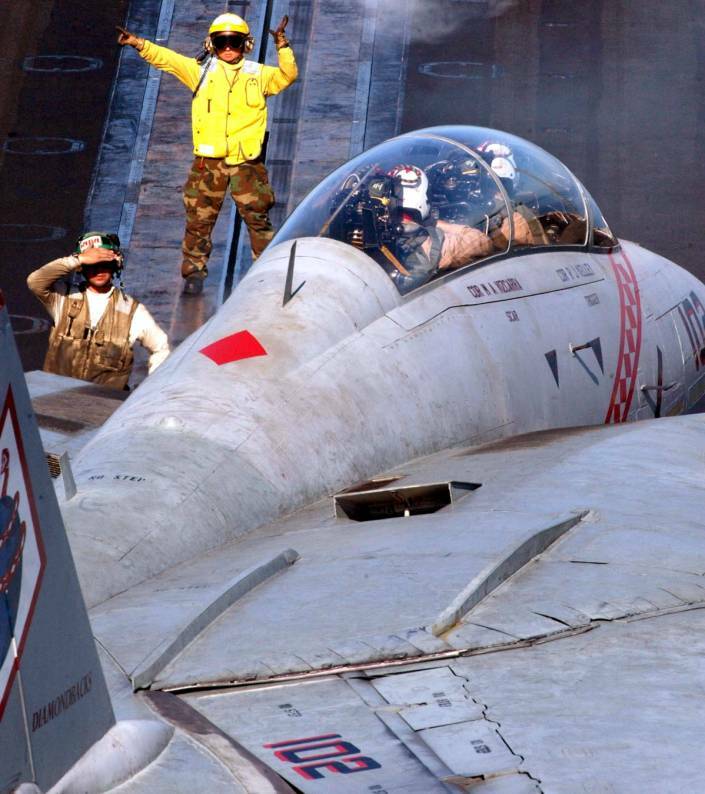 The DIAMONDBACKS were redesignated Strike Fighter Squadron 102 (VFA-102) in 2002. 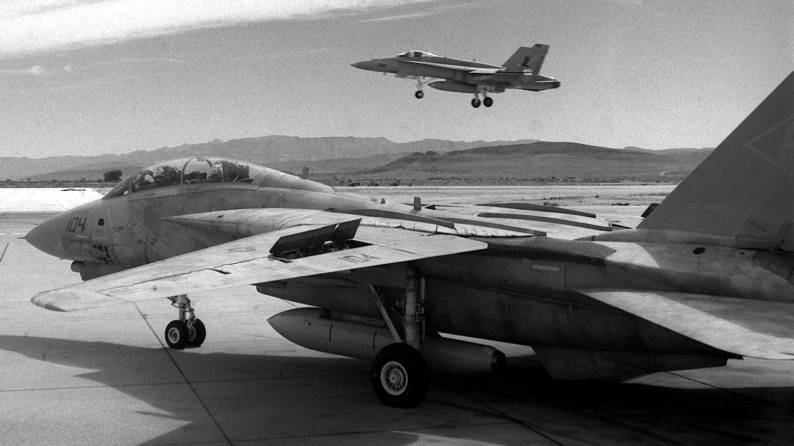 The second Fighter Squadron 102 (VF-102), was established as VA-36 on July 1, 1955, and was immediately redesignated VF-102 on the same day (at the time, squadron designations were associated with their assigned airwing). The squadron was based at NAS Jacksonville flying the F2H Banshee. 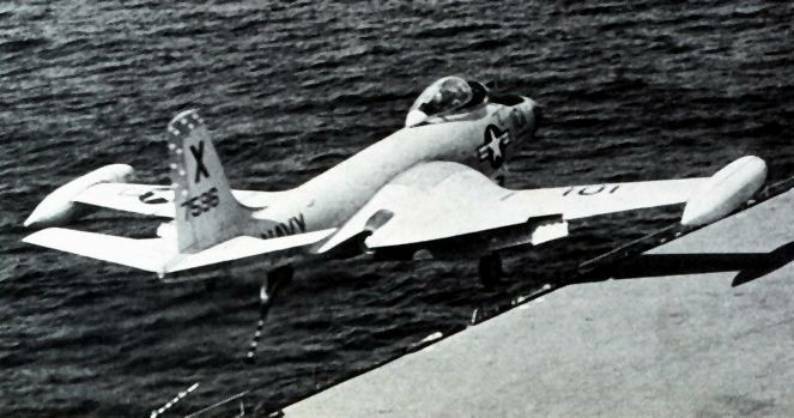 The Diamondbacks inaugural cruise took place aboard the USS Randolph in July 1956. 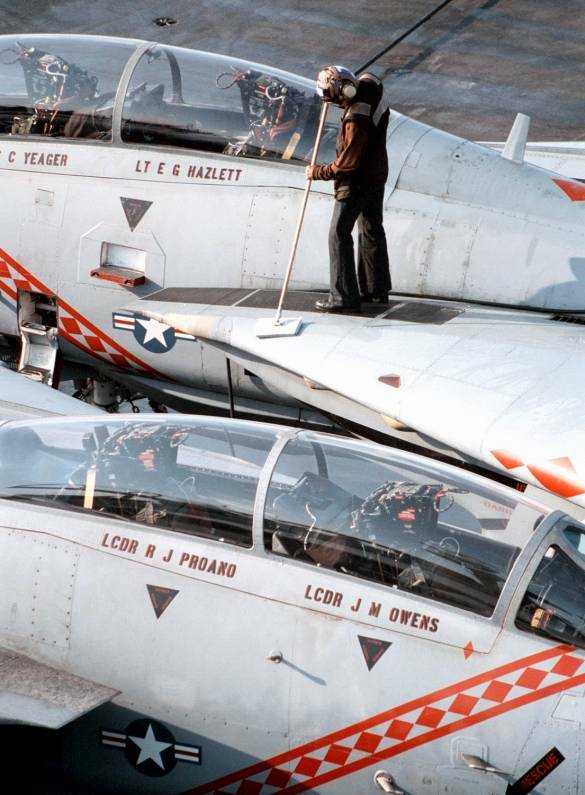 After returning from deployment, the squadron transitioned to the F4D Skyray. 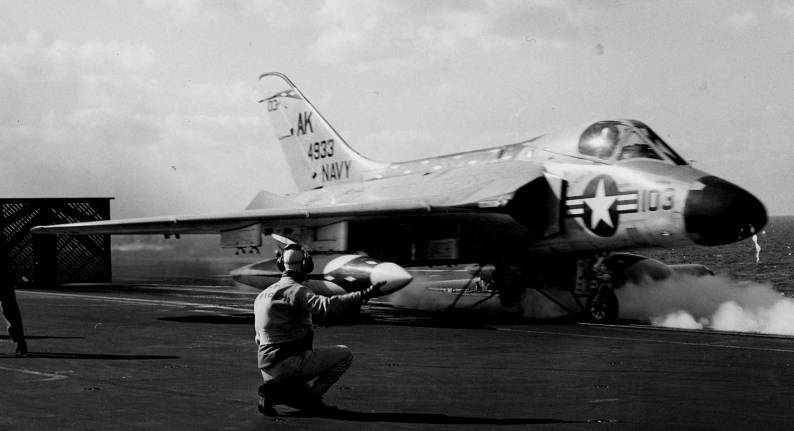 In addition to four 20 mm internal cannons, the Skyray carried the new AIM-9 Sidewinder missile. 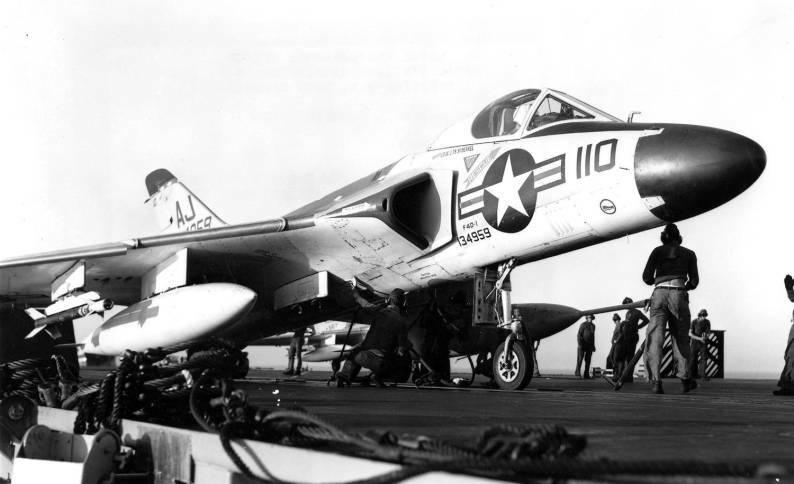 The final cruise with the Skyray on Forrestal was January thru August 1961 after the squadron had moved to NAS Oceana, Virginia. It subsequently transitioned to the F-4 Phantom beginning a 20-year association with the Phantom. 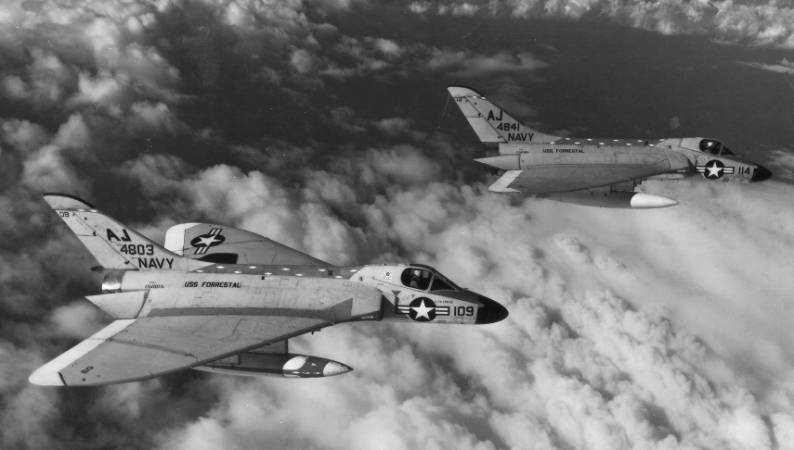 In 1964 and 1966 VF-102 won the COMNAVAIRLANT Battle “E” efficiency awards. Highlights during this period included participation in Operation Sea Orbit on board the USS Enterprise, and combat operations off Vietnam in 1968. In 1975 and 1978, VF-102 conducted cross-deck operations aboard HMS Ark Royal. In 1971, 1973, 1974, 1975: the squadron conducted four deployments to the Mediterranean Sea aboard USS Independence as part of Carrier Air Wing Six, including a port call in Athens, Greece, when they had a political coup; air cover operations for the Yom Kippur War of Israel; and recovery of aircraft debris and bodies from TWA Flight 841 that crashed into the Mediterranean Sea after a terrorist bomb exploded in the hold. 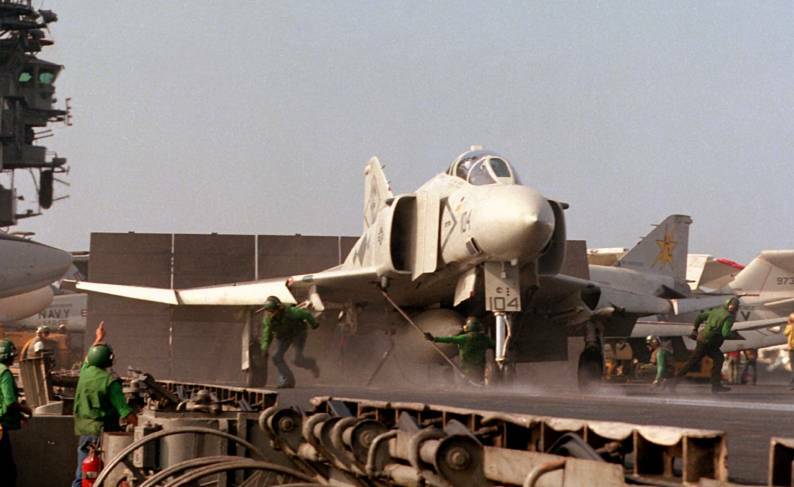 In June 1981 the Diamondbacks flew their last Phantom during an Indian Ocean cruise aboard USS Independence. 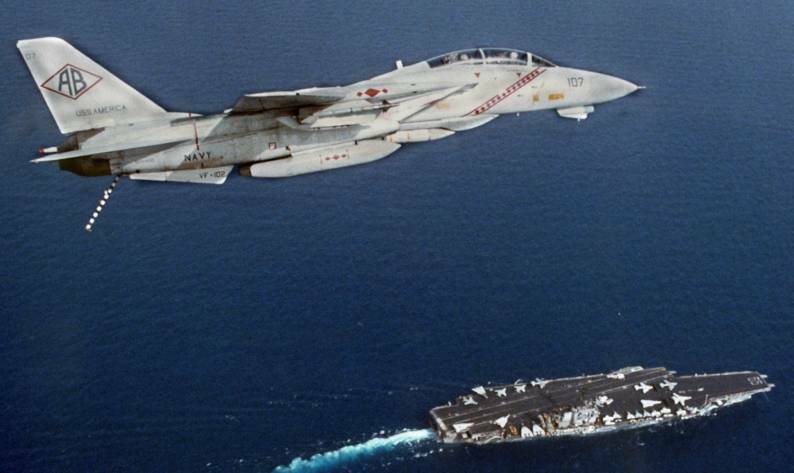 During the summer of 1981, the squadron transitioned to the F-14 Tomcat. With the new aircraft, the Diamondbacks also received a new mission in addition to their traditional fighter role - photo reconnaissance using the TARPS pod. The Diamondbacks deployed aboard USS America in the fall of 1982 to participate in the NATO Exercise Northern Wedding that required high temp operations in the heavy seas north of the British Isles, garnering considerable attention from Soviet Tupolev Tu-95 Bear D reconnaissance aircraft. 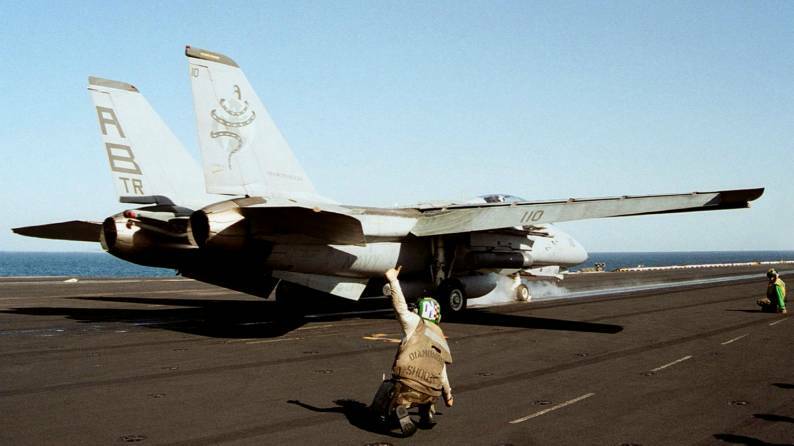 The first Tomcat deployment with Carrier Air Wing One began in 1983 and took America through the Suez Canal to the Indian Ocean. 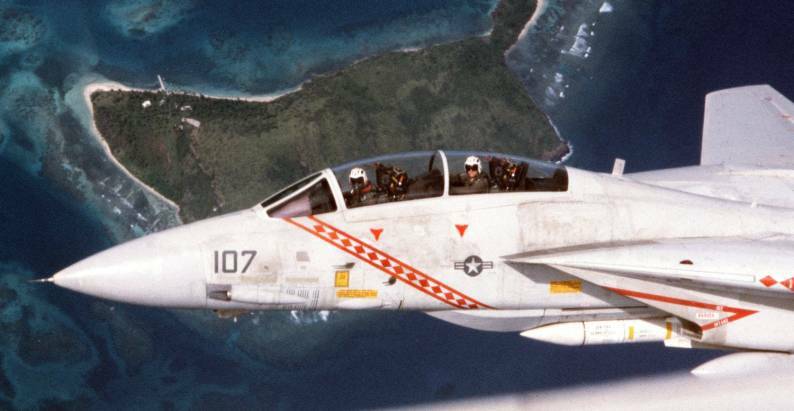 Two VF-102 Tomcats, flying a routine TARPS mission over Somalia were fired upon by an SA-2 SAM site and AAA in April 1983. Both aircraft returned without damage. 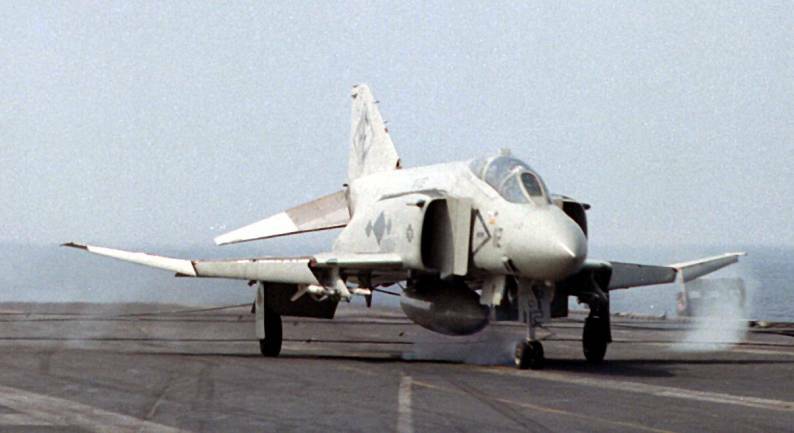 VF-102 deployed in 1984 with the first KA-93 LOROP camera and ARC-182 Have Quick radios, conducting OPEVAL for both systems at sea. In 1985, America participated in the NATO exercise Ocean Safari and again conducted operations in the challenging seas and low visibility conditions near the Arctic Circle and inside Vestfjord, Norway. 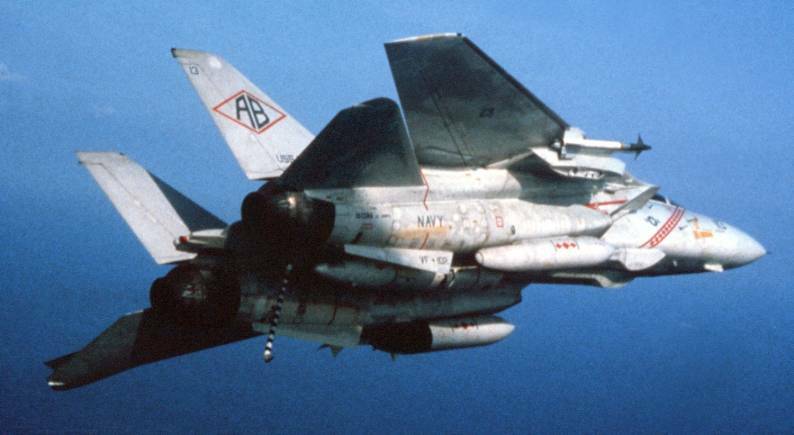 While operating northwest of Ireland, a VF-102 TARPS aircrew flew an unprecedented 1200 nm TARPS mission to locate a Soviet Kynda Class Cruiser transiting the English Channel. 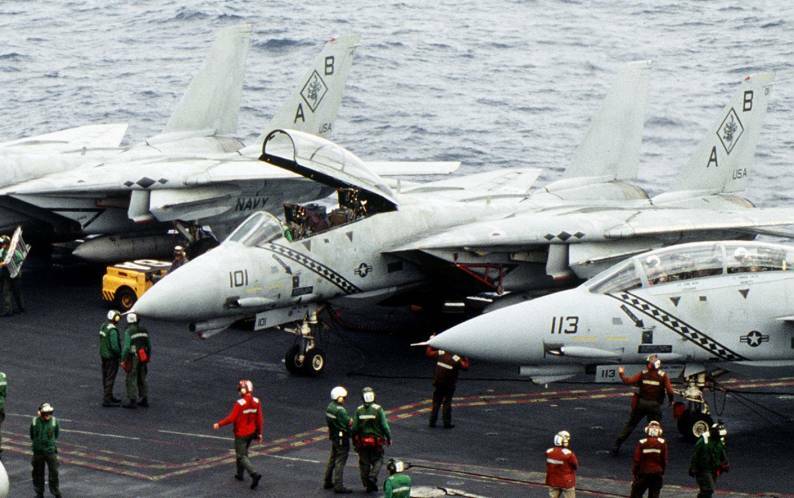 In March 1986, the Diamondbacks deployed on board America, headed for the Gulf of Sidra joining USS Saratoga and USS Coral Sea to challenge the Libyan proclaimed Line of Death. 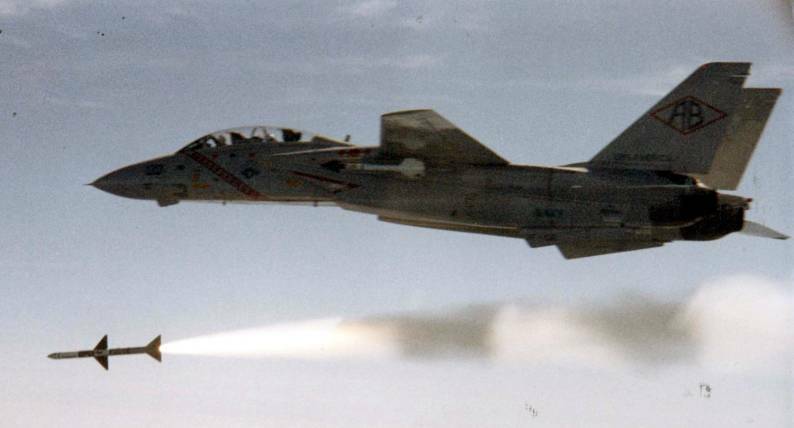 A VF-102 Tomcat was first to be fired on by a Libyan SA-5 and triple-A while flying Combat Air Patrol for Operation Attain Document. A month later VF-102 flew cover for US Navy and US Air Force bombers in Operation El Dorado Canyon. In the fall of 1990, the Diamondbacks joined the USS John F. Kennedy and Saratoga in the Red Sea as part of Operation Desert Shield, arriving the day operations were to begin. 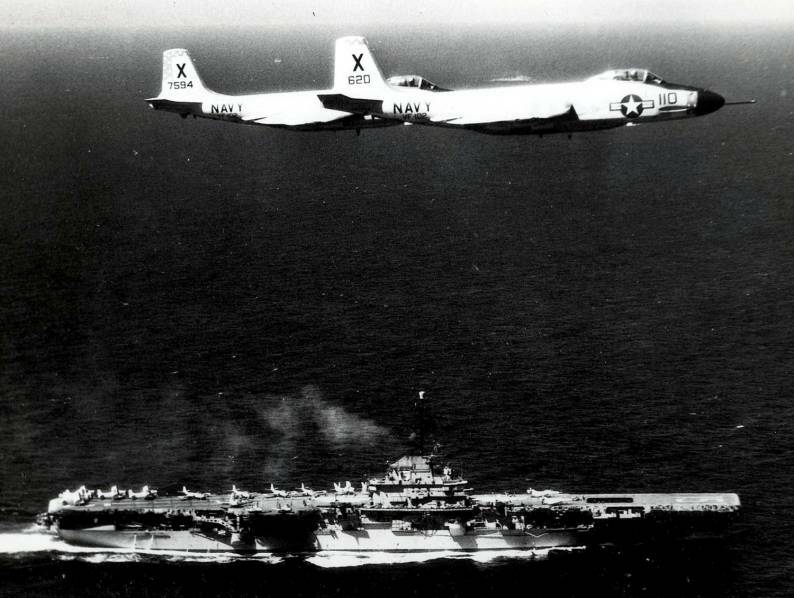 America remained part of the Red Sea Battle Force until directed to join USS Ranger, USS Theodore Roosevelt and USS Midway in the Persian Gulf. 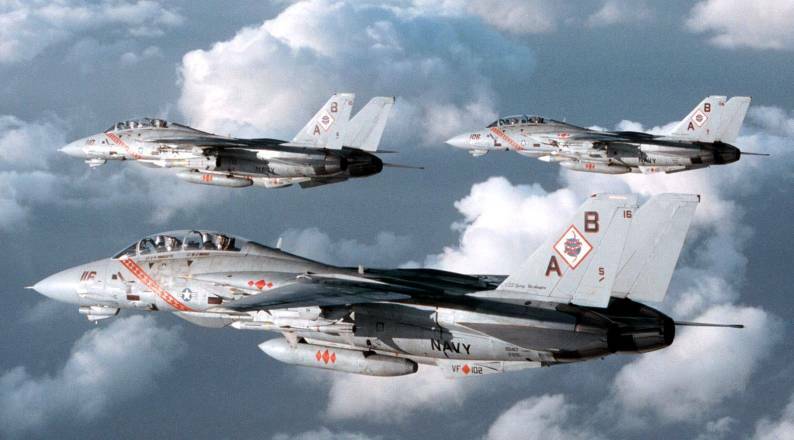 In the six week campaign, VF-102 logged more than 1400 combat flight hours. The Diamondbacks embarked America again in December 1991 for a six-month deployment to the Mediterranean Sea and Persian Gulf. In early August 1993, the Diamondbacks embarked America to begin their third Mediterranean deployment in three years. During this deployment the squadron conducted humanitarian operations off the coast of Bosnia-Herzegovina supporting Operation Provide Promise and Operation Deny Flight. In late October the squadron supported Operation Restore Hope off the coast of Mogadishu, Somalia. By Mid-December they were supporting Operation Southern Watch in Iraq. 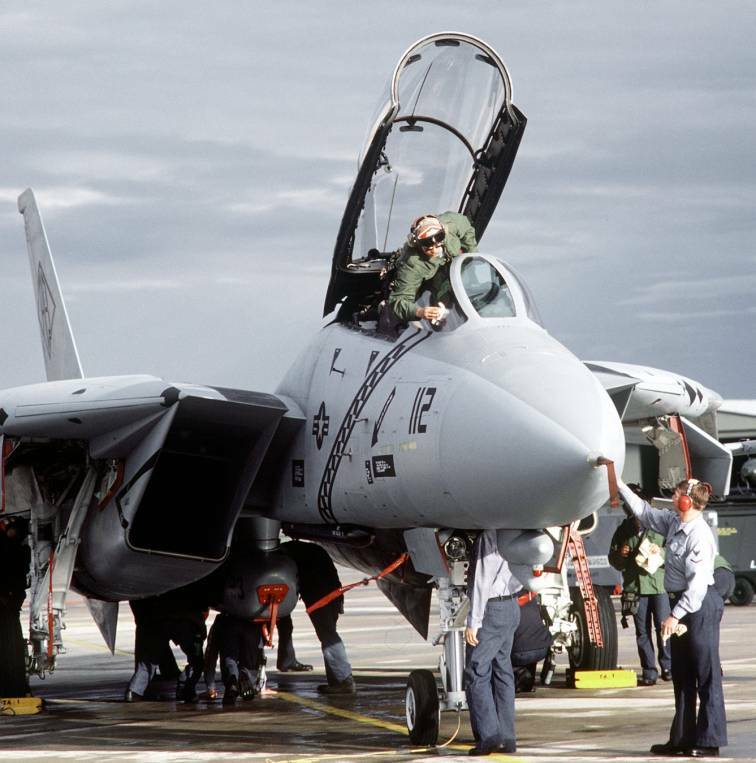 In June 1994, the Diamondbacks returned to NAS Oceana and transitioned to the F-14B aircraft. 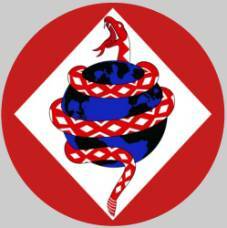 The Diamondbacks 1995–1996 Mediterranean cruise began with an emergency sortie to the Adriatic Sea to take part in Operation Deliberate Force. They then proceeded to the Persian Gulf in support of "Southern Watch". Placement of U.S. ground forces in Bosnia, led to another America emergency sortie back to the Adriatic in December. The Diamondbacks remained in the Adriatic for the remainder of the cruise, logging more than 4,000 hours and over 1,900 traps during the deployment. 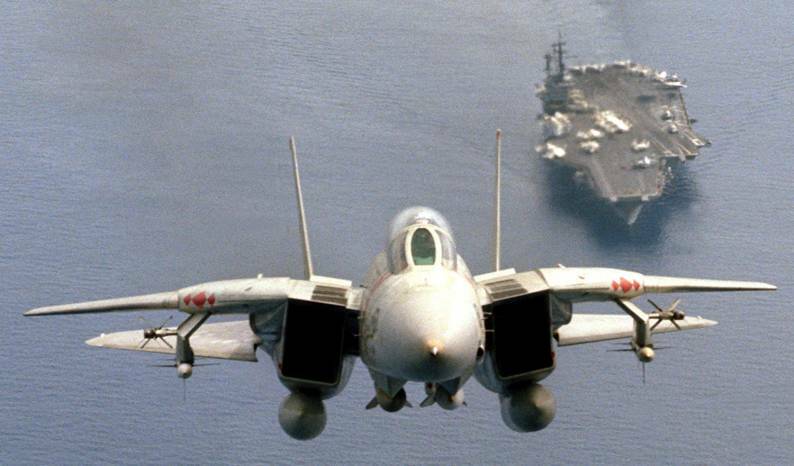 With the disestablishment VF-33, VF-102 became America's sole F-14 unit, completing its final deployment on February 24, 1996. 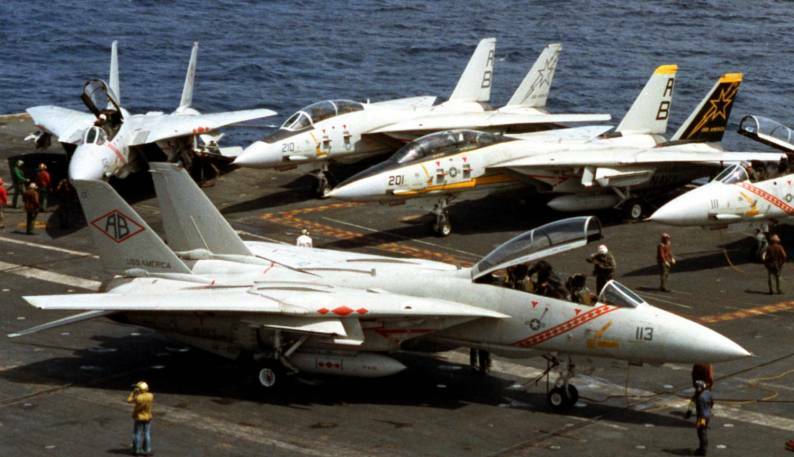 Upon America's decommissioning in 1996, VF-102 (and the rest of CVW-1) was assigned to USS George Washington (CVN-73). 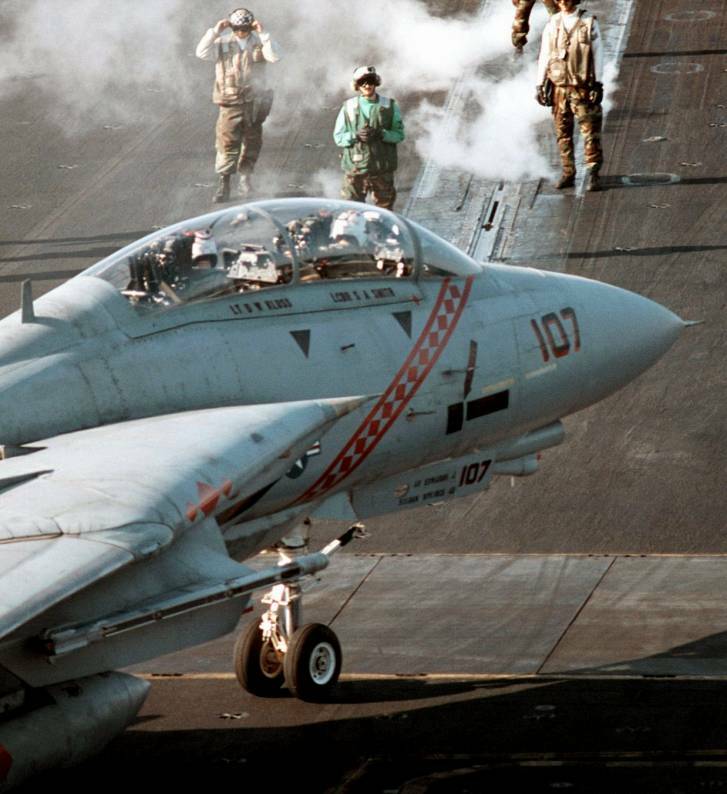 In 1997, the Diamondbacks deployed aboard George Washington. A port visit to Haifa, Israel was cut short late in November as the carrier battle group was ordered to the Persian Gulf in response to Saddam Hussein's barring UN weapon inspectors from carrying out their assigned tasks. As the crises grew George Washington joined the USS Nimitz and HMS Invincible. 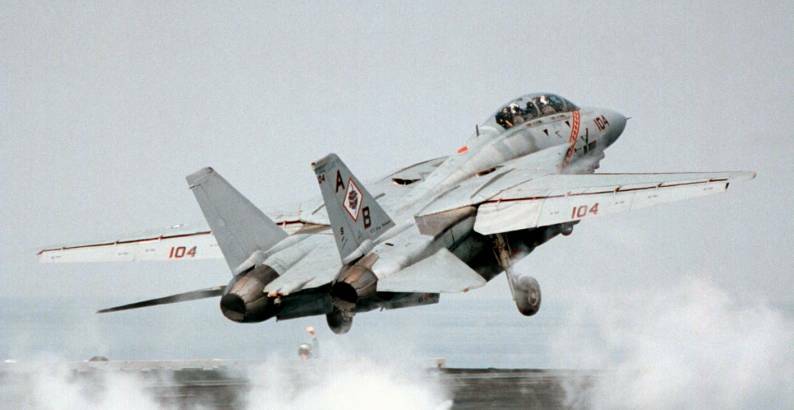 VF-102 returned to Norfolk on March 13, 1998. 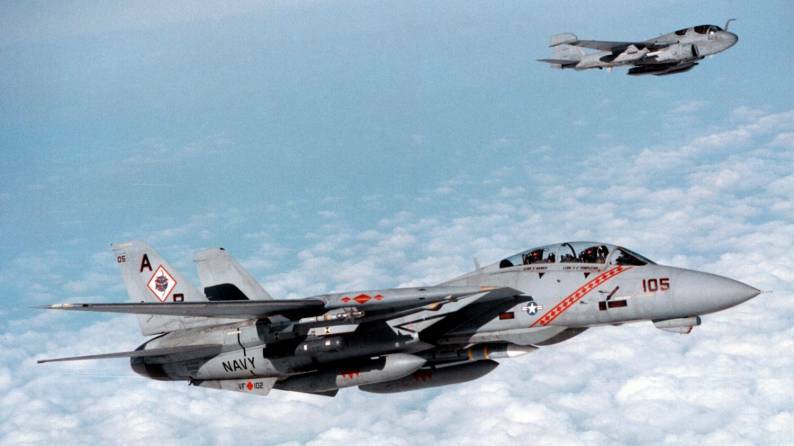 In Autumn 1999, VF-102 deployed again to the Persian Gulf in support of Operation Southern Watch over southern Iraq. 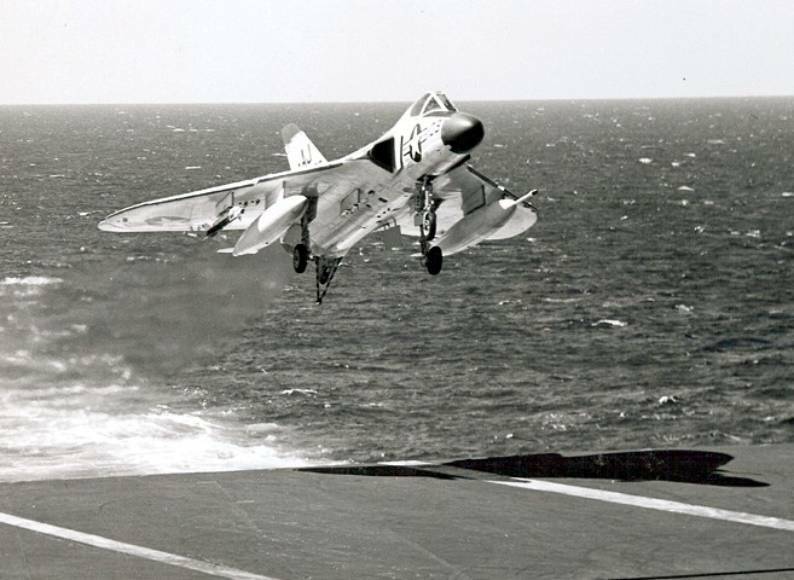 VF-102 carried out strikes on numerous anti-aircraft and radar sites and conducted numerous TARPS missions. 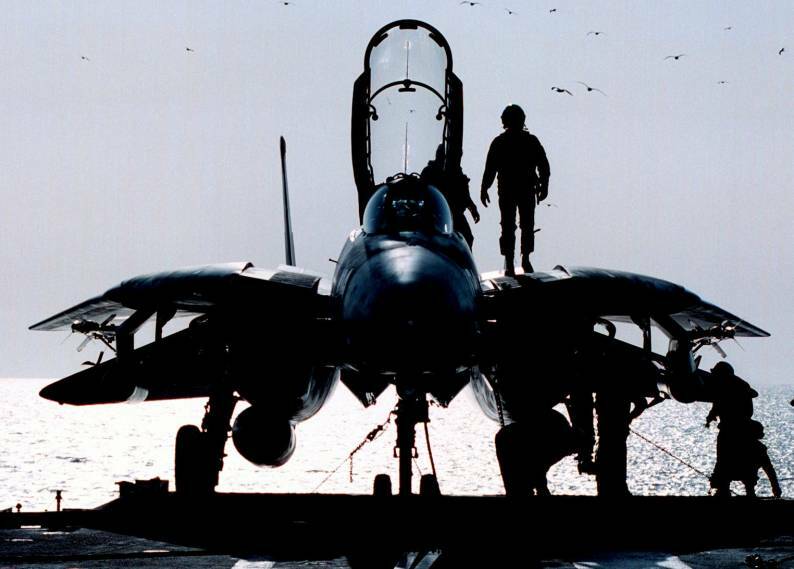 On September 19, 2001 in the wake of the September 11, 2001 attacks, VF-102 began a scheduled deployment to the Arabian Sea as a part of Operation Enduring Freedom and began combat operations in support of Operation Enduring Freedom. 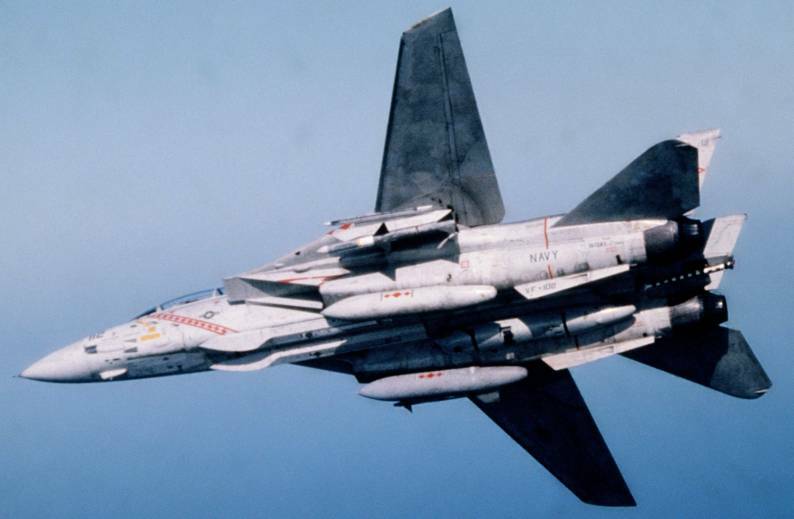 During that deployment VF-102 flew 5000 combat hours and dropped 680 bombs as well as guiding more than 50,000 pounds of precision guided munitions launched by other aircraft, VF-102 dropped more ordnance and flew more combat hours then any other F-14 unit during the war in 2001 and 2002. In addition, as part of the USS Theodore Roosevelt Battle Group they were at sea for 159 consecutive days, breaking a 20 year old record. Following the return from deployment, the squadron moved to NAS Lemoore, California to begin transition training in the F/A-18F.